I'm not in tandem with a lot of things my old friend Syed Akbar Ali writes on his popular blog these days, especially his provocative postings on Islam, but if blocking his blog is the work of our authorities, ie Salleh Said Keruak's ministry or its subsidiary MCMC*, in the name of protecting the public at large or for whatever reasons, I have to strongly disagree. Blocking the blog after it has notched nearly 30 million page views does not only seem like an afterthought, it smells like a cheap aftershave too. If the blogger has indeed violated the laws of this land, have the cojones to go charge him in court and face the wrath of the Rakyat :-! Former Attorney-General Gani Patail did (and look how popular he is today with the anti-Najib crowd). Gani didn't just charge Syed Akbar, he also took RPK to court (and perhaps a few other bloggers I don't remember or know of in those heady Mahathir vs Abdullah days)! p.s. I'm assuming that this is the evil work of our authorities. 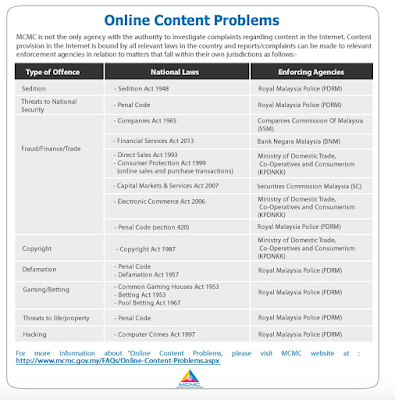 I stand corrected - there have been cases of perasan (full of oneself) bloggers who'd shout government clampdown when it was just a malware attack. Rightly said. Take Syed Akbar Ali to court and charge the man properly. This is just not so cool! 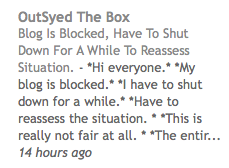 Syed's blog indeed blocked. not sure what law did he broke but i expect him to be called in by the auhorities too soon. Govt doesn't simply blocks a website unless they find something against it. I say let Syed defend himself in the court of law rather then any attempt to silence him. dunno, I tried to access from Japan, but it seems that the Blog have converted to access upon invitation. I don't think it is block though. Usually blocked website like Serawak Report can be access from foreign country and not while in Malaysia. So I think this is something different. It smells fishy because the coward syed always, without fail, deleted his old entries. At most he only kept 3 entries. So I am questioning this. Also note that Apanama blog is not blocked. He too had cried wolf before that his blog was blocked. Don't know much of the criteria for blocking 'Outside the block' err..'Outside the box'! Was an ardent follower and read his block err.... blog except when hospitalized or account suspended for late bill payment. But for months have decided to skip his take on everything of the Islamic world, advocating his own brand of Islamic interpretation and condemning anything done in the name of the old/new school Islamic scholars. To him, it seems everybody was wrong and his is the correct one that cannot be questioned! Even in politics he seemed to have the idea only his opinions count and the doing actions and talk of other were mere rubbish. That is what came to my mind. Everything he said is the truth and what others did or say is not right. No benefit of the doubt at all, never want to give credit even if credit is due. So to keep the tales short, yours truly only stop at his blog to peruse his headlines and move on to other source of reading. As was said before, do not know whether what he did was right or wrong in the eyes of the laws of the land, but his writing is not interesting any more. I find the blogger OutSyed The Box's writing to be more in line with the workings of an anti Islam, hateful MURTAD. It's just my opinion and as championed by bloggers all over, we are all free to express an opinion. 1. Thank you Brother Rocky. 2. We may not be on the same side but that does stop us from being journalists. 3. Salleh Said and the Multimedia Commission have no right to act as judge, jury and executioner. 4. These are not phonographic or subversive sites. 5. Take then to court if they have indeed broken the law. 6. Don't give further credibility to the allegation that we are fast becoming a dictatorship. 7. Bru, this country of our is worth saying - disagreement aside. Arigato for the info, Someone From Japan. Orang nama Din ni tak ong lah. Kesian Turtle. Your blog has zero chance of being blocked by the Multimedia Commission. Why hasn't Jibby boy found the two round objects required to sue the SR, WSJ, NYT, FT, SMH and Sunday Times UK? They have all made detailed factual allegations against your hero. It's only taxpayer money, and the Bugis loser has no qualms about wasting that by the billion. Unless, of course, the facts published were true. That would be a real problem, right? Provocative? His posting on Islam is common sense. It's only provocative to the religious fundamentalists and zealots. Din turtle block, outsyed after he got block said gonna stop for awhile. Thus came page by invitation only. Well din page still accessible after changing dns to Google dns or any other free dns. Please stop behaving like a Sunni-Daesh aka IS terrorist. Anybody upholding and championing the holy-Quranic scriptures, cannot be a murtad. Whether or not someone is an apostate, just leave that decision to Almighty-Allah. Please bear this in mind: Even those extremist Syiah in the middle-east, had never 'murtad'kan or disowned the Sunnis. Instead, its the Sunnis that had gone too far, declaring Syiah as 'kafir'. Ada juga laporan mengatakan bahawa seorang pegawai tentera Yahudi berpangkat kolonel, turut berjuang bersama Daesh di Syria. Kemudian Amerika 'membantu' pula Arab Saudi (Sunni) mengebom Yemen yang dikuasai Syiah-Houthi. Maka bersemarak dan merebaklah lagi perbunuhan sesama Islam, Sunni dan Syiah. Kepada Amerika, Zionist dan Arab, kedua-dua, Sunni & Syiah adalah Islam. Jika kita turut 'membantu' untuk menjatuhkan Hafez Assad, bermakna Amerika dan Zionist telah berjaya memperdayakan orang-Melayu untuk berbunuhan sesama sendiri. Sebab itu OSTB menganggap Ustaz dan Ulama sebagai 'orang yang kurang cerdik'. Mungkin ada asasnya, beliau beranggapan sedemikian. When I tried to access Syed's blog it asks me to sign in with my Google account, so is it blocked or has he required that access is conditional upon his approval or what? Or maybe, that prompt "sign in with my Google account" is a ploy to harvest the IP address of visitors to OSTB. In Singapore can access. But all posts have been removed. Only one entry from January 26 on a pig picture. The remark: "Have you seen piggy"
I like to think that we are on the same side. Sometimes you on the attacking side and me, backpedalling, defending. At other times, our roles reversed. Shia are rafidah they insult Aisha (ra) and the prophet (saw) noble companions. You are doing what you accuse Muslims of doing making statements that are slanderous. Umar ibn al Khattab (ra) said that the prophet (saw) passed judgement based on the law while after he passed away they passed judgement based on what is apparent. Your statement that it is up to the almighty is not consistent with what the messenger and his companions did. When someone blasphemes the deen it must be countered. On the day of judgement we will be asked what we did to defend this deen what would you say brother? d) The "leaders" can steal, cheat and rob the rakyat with no obstacles. And that would suit the dedak bloggers just fine. Might get a little more chicken feed! It is high time ostb get the taste of his own medicine . All the while he has been omitting those comment that are not favourable to him . He did not give space to those who disagree with him or those who make caustic comment on his article . So .. i'm for the blocked . that was tun m's world la dey! Thank you MMC for blocking that egoistic Syed. I agree he's full of himself. Acts like he's the cleverest man in M'sia. Writes nonsense. Try commenting against what he said. Your post will be deleted. Good riddance to bad rubbish. We are better off without him. Bring the anti-sedition act right now, AG. Even Islam is being criticised by this Syed fella.